Take advantage of our amazing off-season rates as well as some quiet time before or after the busy summer season to walk along the many kms of our private beach! We have some openings starting in mid-June and also in early Sept (after Labour Day) when off-season rates start again. The off season rates are $150-175 per night (3 night min.) or $900-1050 per week. Please go to "The Cottages" page on the website to view openings for each cottage, under "Check Availability". Email PenderosaCottagesPEI@gmail.com for more info. Please Note - Full week rentals only during the months of July and August. For June or Sept, we will also rent for a minimum of 3 nights. Please check cottage availability pages for specific dates and rates. We do allow pets on the property, on leash at all times, and with a pet surcharge of $150 per week or $25 per night. We have multiple openings for both June and Sept, and take advantage of off-season rates! For July and Aug 2019, we have the following openings: Sat Aug 24 - Sat Aug 31: #7 (3 bedroom), $1250 per week; Please check cottage availability on this site, or email PenderosaCottagesPEI@gmail.com for more info. 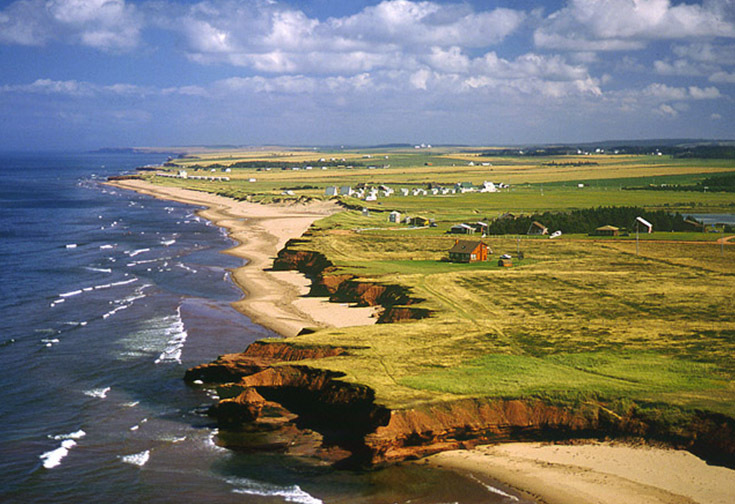 Our cottages are just 2 minutes walk from one of the finest sandy beaches on Prince Edward Island. You can relax and enjoy the sun and surf of the Gulf of St. Lawrence or walk for kilometers along the beach. At the end of the day enjoy the amazing colours of the sun as it sets over the ocean. We have two and three bedroom cottages equipped with kitchen appliances, utensils, bedding and towels. All of our cottages have a dishwasher and numbers 7-10 also have a washer/dryer. For those cottage guests who don't have laundry facilities in their cottage (numbers 5 & 6), we have laundry facilities on-site for your complimentary use. All of our cottages have satellite television with DVD players and Wi-Fi is available on-site. We are centrally located at 330 Penderosa Road, off Route 20 in Darnley; approximate driving times are 15 minutes to Kensington, 25 minutes to Summerside, 25 minutes to Cavendish, 45 minutes from the Confederation Bridge, and 55 minutes to Charlottetown.